You can buy a copy here, or get more details here. To find out more about me, or how to get in touch, see my author page. For the latest news, follow me on Twitter or Facebook. If you're in Kent on Friday, or fancy a trip there, I'm a late addition to the line-up for Nudgestock, the behavioural economics festival organised by Rory Sutherland of Ogilvy (and the Spectator's 'Wiki Man') columnist. I'll also be appearing at the York Festival of Ideas on Monday evening. PS Also wrote this for the Telegraph on whether robots are going to take our jobs, and if so how. The last couple of months have - appropriately - been a whirlwind, but things are now finally getting back to normal after the launch of 'The Great Acceleration'. My next project is to put together a list of recommended reading, as promised in the book - to share the books that most inspired me when writing. Before that, however, I'm appearing at the Hay Festival - Britain's largest festival of books and ideas - this coming Tuesday, and then moderating a panel at the OECD Forum in Paris the next day. Then on June 13th I'll be in York for their Festival of Ideas - it would be lovely to see any and all of you there. Meanwhile, in case you're wondering what I've been up to, here are a selection of my recent pieces about the book, or drawing on the ideas in it... if they interest you, why not buy a copy? 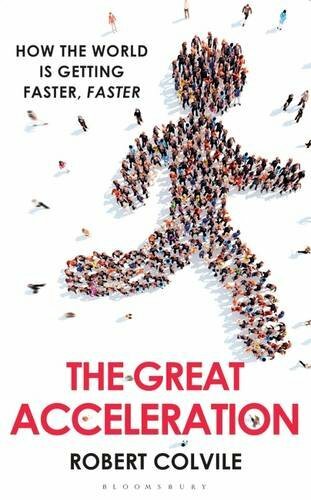 As of today, 'The Great Acceleration' is on sale in the US - you can buy a copy here. In the meantime, here's a copy of the US cover - note the different take from the UK version. Anyone have any thoughts on which works better? No spam, no junk, no ads.